You will find ac service gauges in every ac installer’s tool kit. So, we stock all types of service gauges, gauge hoses, & service couplers from cheaper diy quality to pro quality for every day use. 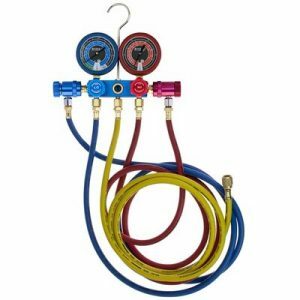 Purchase your gauge and hose sets here at Auto Compressor World. We have all types and different price points available today. Our stores stock both brass and aluminum gauges. So, we have gauges for the pro. And, we have gauges for the DIY. Is your hose worn out on your gauge set? We have your replacement gauge hoses in stock. We stock both 6ft & 10ft gauge hoses. Also, we stock couplers so you can connect your gauge hoses to service ports. In fact, we carry both snap-on quick couplers, 90 degree couplers. Auto Compressor World know ac compressors and ac service gauges, hoses and couplers. Buy your ac parts from the pros. Purchase your parts online. Or, call us today!